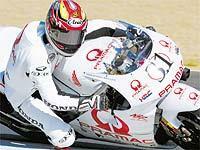 Honda rider Tetsuya Harada's 2002 world championship preparations have suffered a massive blow after he highsided his NSR500 and broke a collarbone in tests at Estoril. The former world 250 champion has chosen not undergo surgery despite the new season being just six weeks away. Harada expects to be fit enough to ride at the crucial IRTA test in Barcelona on March 9, when all the new four-strokes clash for the first time. What was your first bike? When I was 13 I was working in my uncle Pierluigi Aldrovandi’s workshop. Eugene Laverty suffered a fracture in his left arm following a crash today during testing at Jerez.